​With the international break now in full swing, the absence of Premier League football has left something of a void in this week's schedule - but Arsenal are making the most of it. Unai Emery has taken his side away for a warm weather training camp in Dubai, during which the Gunners will be put through their paces in an alternative environment with the aim of returning in optimal shape ahead of the final stretch of the season. The north Londoners will hold an open training session and visit some local scenery during their stay, as well as taking on Al Nasr in a friendly match on Tuesday. It means that the international break is far from a week of rest for the Gunners, but one which should prove useful. Here is a selection of six things to look out for at ​Arsenal's training camp in Dubai. As would often be the case during a pre-season tour, Arsenal have included a raft of young players from the Under-23s setup which have seen few opportunities in the first team during the season. With many senior stars such as ​Pierre-Emerick Aubameyang, ​Aaron Ramsey, Granit Xhaka and Sokratis Papastathopoulos all away with their national teams, Emery has filled the gaps in his 23-man squad with young stars including Tyreece John-Jules, Xavier Amaechi and Zech Medley. With suggestions that young players struggling to get into the first team picture of Premier League clubs could opt to take the 'Jadon Sancho route' of moving elsewhere in Europe, this training camp could provide a key opportunity for Arsenal's youngsters to catch Emery's eye. As with the plethora of young stars that have travelled, the absence of many established stars has opened up space for players on the fringes of Emery's first team to stake their claim. Carl Jenkinson was expected to move on last summer, but has surprisingly remained part of Emery's senior setup this term, and has made seven appearances across all competitions. The right back is joined by the likes of Denis Suarez and Konstantinos Mavropanos who are also seeking to impress Emery. Mavropanos has shown great promise during the early phases of his Gunners career but has struggled to find consistency in the first team, partly due to injuries, whilst Suarez has had limited impact since arriving on loan from ​Barcelona in January. Both will be keen to prove their worth in Dubai. With the likes of Aaron Ramsey and Granit Xhaka absent from the tour, ​Mesut Ozil has a chance to stamp his seniority on the Gunners' ranks during the training camp. The mercurial German has fought his way back into favour under Emery in recent weeks, after starting in each of the crucial wins over ​Manchester United and Rennes, having previously appeared out of the picture at the Emirates. Ozil looks to have adapted to Emery's methods and is now giving the Spaniard the levels of application and intensity that the head coach demands, and has the opportunity to convince Emery of his importance to his club in Dubai. Aside from Arsenal's internal affairs, the Gunners will also have the opportunity to make history in Dubai as they open the brand new Al Maktoum Stadium as they take to the field against Al Nasr on Tuesday. The event will give Emery the chance to raise his players' fitness levels and to further drill his stars with his demands, but the chance to play in the maiden event at a new venue also raises the profile of the friendly encounter. Arsenal have a huge overseas following around the world and their participation in such an event further reflects their mighty global standing. 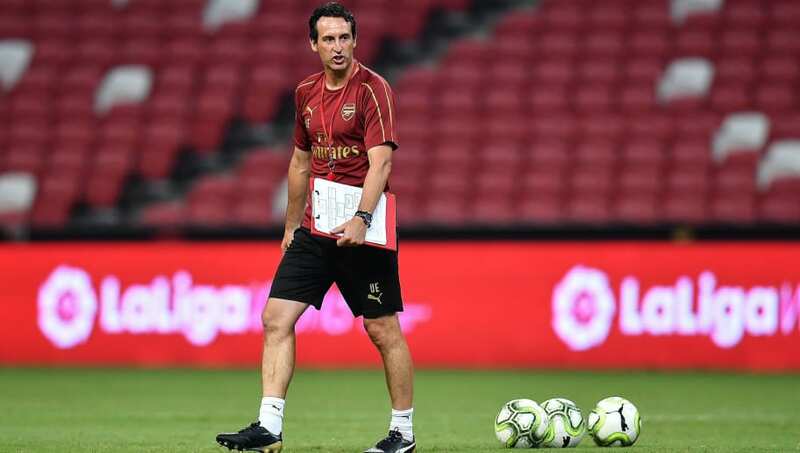 In what has been a divisive factor during Emery's debut campaign as Arsenal's head coach this term, the Spaniard has often switched formation and rotated his team selection between games. Some have taken Emery's changes to reflect a lack of clear direction and identity, whilst others have argued that it has introduced the kind of pragmatism and diligence which has been lacking at the club for many years. In any case, the 3-4-1-2 system appears to have stuck in recent weeks, providing the necessary defensive stability whilst maintaining plenty of threat in attack. The training camp offers Emery a chance to work on the system more and maximise his players' functionality in the shape. Arsenal have been terribly unfortunate to see three first team stars all ruled out for the season with serious injuries. A knee injury prematurely ended Hector Bellerin's season in January, whilst ​Rob Holding and Danny Welbeck are ruled out through knee and ankle problems respectively. However, despite all three being highly unlikely to feature for the Gunners again this season, the the trio have travelled with the rest of the squad to take lighter parts in training and to take part in other activities during their time in Dubai. Arsenal fans will be pleased to see Bellerin, Holding and Welbeck back among the action and in the squad, though their presence on the pitch continues to be missed.